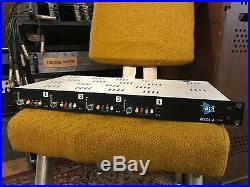 API 3124+ single rack preamp. 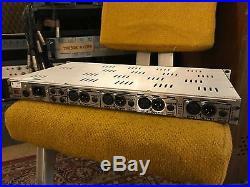 4 great looking & sounding API preamps. Channel 1 & 4 phantom power buttons do not stay engaged. The phantom power works fine on all channels it is simply whatever mechanism that holds the button in after pushing it in does not grab. The problem is with these two buttons to stay engaged & not the actual phantom power signal. I did gaf tape buttons 1 & 4 down once for a session which worked fine and did keep the phantom power engaged. Channel 2 & 3 phantom power buttons stay engaged without any problems. The preamp is in otherwise perfect condition. All other buttons work properly. The unit is priced lower than the average street value to account for this imperfection. The item "API 3124 preamp (4 x 312 api preamps)" is in sale since Wednesday, April 26, 2017. This item is in the category "Musical Instruments & Gear\Pro Audio Equipment\Preamps & Channel Strips". The seller is "joelnanos" and is located in Kansas City, Missouri. This item can be shipped to United States.